Fender introduced a "Fretless" Bass in 1970 and this optional model appeared in the 1970 catalog. By this time, Fender had begun to realize that there was a small but growing demand for it. Bass players had begun removing the frets from their basses to create their own versions and Fender eventually got hip to it and offered an "Un-Lined" fretless neck version, although the model did not receive any special decal or designation other than the absence of frets. To assist the brave Fretless players, they did leave the fingerboard side dots! The factory List Price mirrored the matching Fretted models. Interestingly, in addition to the optional Fretless Precision, and for the 1st time that same year, Fender also offered a NARROW neck option on the Fretted Precision for a slight price increase and they continued to offer Left-handed versions too. These new models and optional features were produced and offered into the late 1970's, when once again, many big model changes were under way leading them into the next decade. With the exception of a very tiny handful of Fretless Jazz Bass models, which were not officially offered to the public and didn't appear in any catalog, the Fretless Precision model was the official "Fretless" offering. These were available with a solid Maple neck or a laminated Rosewood fingerboard, and after having tried both, I feel that the Rosewood fingerboard model seems to work best as far attaining a Fretless feel and sound. I have examined, tested, serviced and set-up this instrument and found it to be factory-correct and unmolested. All of the electronics, nut, finish and both the plastic and metal hardware are correct and Original to the Bass with the exception of the "Thumb Rest" which I replaced with a newer one as it was missing when i purchased it. The Chrome plated Bridge and Pickup Covers were also absent. The potentiometers are both dated 1974.
normal wear, but there are no significant cosmetic or structural issues to notate. The CASE is Original to the Bass and is excellent condition with a functioning handle, latches and hinges. The STRINGS were Not replaced. New round wound bass strings tend to not be a good choice with a fretless due to all of the extraneous metallic and finger noises, so I elected to leave the older, worn in and mellow sounding round wound strings on it, they are more than 20 years old but work and sound very good on this bass. The bass is 44 years old now. I originally purchased this bass to play, which was about 25 years ago. I soon discovered that I am not as much a fretless player as I had hoped and have mostly had it stored. When I was searching for a Fender Fretless, I did encounter a few examples but ultimately settled on this one for the following reasons. This particular bass is VERY light weight, which is uncommon for a Precision Bass from this era. The body is made from beautiful and nicely matched wide-grain Ash, and the Natural finish has turned a warm, rich and inviting Honey color. This Ash body also produces a strong and bold tone, this bass really "sings". I also knew that I wanted a Rosewood fingerboard as I found the maple neck versions didn't produce the same tone, or feel nearly as good, so to Me, this was the ultimate Fender Fretless and it was Not easy to find a bass with these exact features and LIGHT WEIGHT. 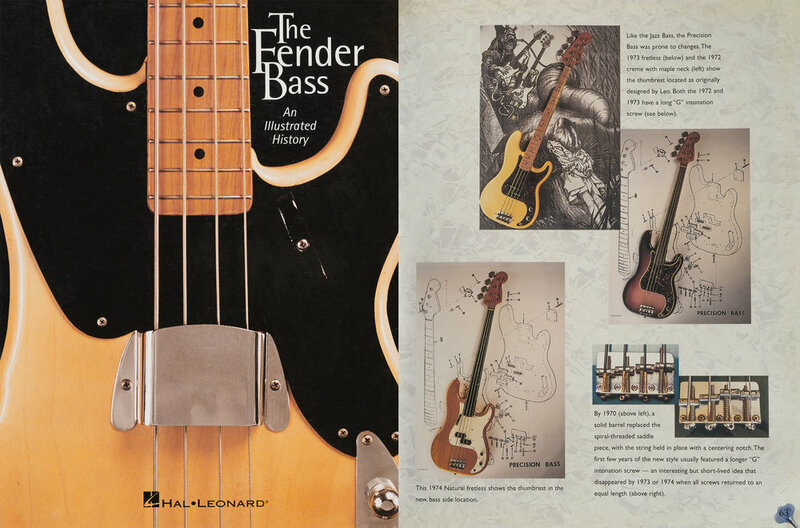 COLLECTORS may also be interested to know that this bass was featured in my Fender Bass Book on page 63. If you've ever wanted a great Vintage Fender fretless, this is a unique and special opportunity as these were generally made in small quantities and this particular Bass is an exceptional and published example that is ready to Play or add to your Collection! Please inquire.